I had a bit of an adventure today. I stopped at Wegmans on my way home to get tater tots and sloppy joe mix. When I got home I discovered I didn’t have my phone. Retracing my steps, I figured it fell out of my pocket somewhere between checkout and my car. I had texted Aaron right after checkout. I had to take Oscar to the vet to get his staples out so I put him in the car and drove back to Wegmans. They hadn’t seen it. I drove back home and got my laptop out. 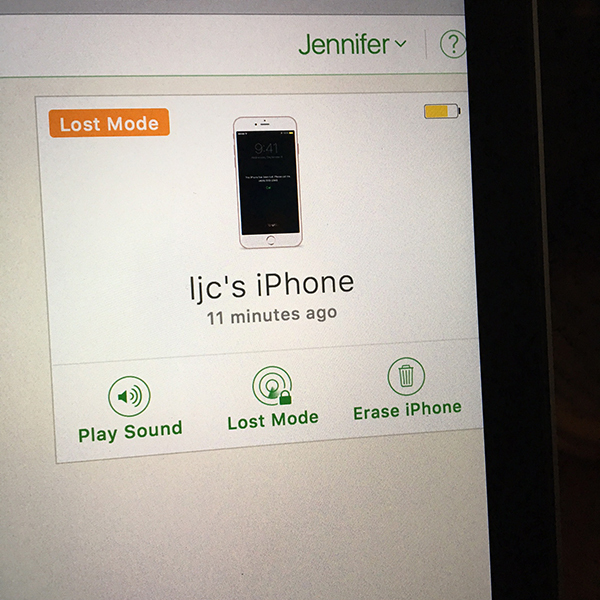 Using Find My iPhone I locked the phone, added a message to it to call Aaron’s phone if found, and then searched for it. It was still at Wegmans. I drive back to the store and ask Helping Hands to help me look for it. Nothing. At this point I had to get Oscar to the vet. After the vet, I come back home and open up Find My iPhone. I now see my phone making a path from Wegmans heading due north. At first I think Aaron picked it up but realize he is in a meeting plus the phone is inching along very slowly. Too slowly for a car. I was watching it creep along up the street before my eyes. I had to do something. I jumped in the car with my laptop and parked at a gas station at the last intersection I saw it at. I could see two people in the path my phone was on - one guy getting on his bike at the library (doesn't make sense for it to be him - just getting on his bike) and another guy slowly meandering a half block further up the sidewalk. Gripping my laptop I took off after him on foot. He was an older, not well kept, obviously down on his luck sort. “Sir were you just at Wegmans?” “Yeeeaaah” “Did you find a pink iPhone?” He looks uncomfortable. “I don’t know.” He sort of shuffles around - not confrontational. “If you found it, I just want it back, please.” “I have a lot of phones.” he tells me. He takes off his back pack and starts rooting through it. It’s full of phones and bottles of cough syrup. He shows me a silver iPhone 6S he had wrapped in newspaper and tucked in a Wegman's pharmacy bag. "No it's pink." (thinking back I should have taken that phone too and tried to find the owner) At this point, I get on public wifi and I can see I am right near my phone. I hit the button that makes my phone play a sound and a chime noise comes his bag. I peer in, see it and take it. "Someone must have put it there!" he exclaims. Once I have my phone I tell him “Thank you” then turn around and walk away. In hindsight this plan might not have been a very good idea - my parents are going to pop a gasket when they read this - but hey, I got my phone back. PS - Just wanted to mention this was not in a dark alley, it was in the daylight and right in front of restaurant windows with plenty of traffic. Well done getting it back, but yeah, could have gone bad.